No searching her heart for things of heaven. The kind sensuous women want. Song of Songs is she, literally. Wrong race, wrong morals. Them! He seeks only the holy of heart and mind. Right? He loves the righteous, not the suspicious. Can’t she learn her proper place? She acts as if God speaks to her. Even heretical Samaritans knew that, knew her. Divorced! How many times? Living with some man. A failure, a social misfit, irreligious to the max. She came to the well at noon, shamelessly. Decent women came together in the morning, not her. She comes to seduce Him from His mission! Not the kind decent people care to meet. She wants a drink, I’ll bet she does. Not just any man, a foreigner! So alluring, so tempting, so seductive. Is she the lover or the beloved? So ready to embrace any man. How dare she speak of God? He sees right through her. To believe, to convert, to share the Gospel truth? 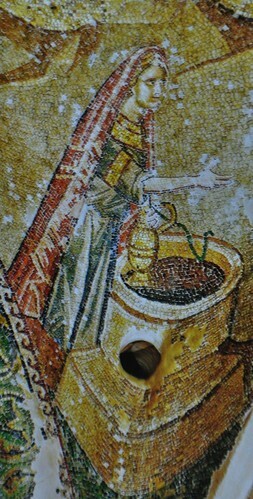 The woman was a sinner, that woman at the well. She confessed, God already knew. It helped her see. She found what she looked for but could not see. Rightly named. Disciple, saint, evangelist, martyr. Of the Living Water whose source He is. I’ve come to the well, a sinner too. “Give Me a drink,” says He wearily.